Roll out the seamless dough into a rectangle. You will be cutting 12 sqaures from the dough (equal in size). Spray a 12 cup muffin pan with non-stick cooking oil. Place a douch square in each cup forming it to fit the botton and sides of the muffin cup. Combine the condensed soup, tuna (separate the tuna into flakes) and seasonings. Mix well and then fill each muffin cup. 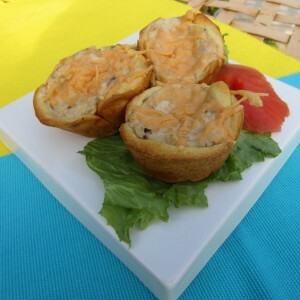 Top each tuna cup with low-fat shredded cheese. Bake in a 375 degree oven for 10-12 minutes.